FOR USE WITH EPSON EXPRESSION XP-312 PRINTERS. Simply remove all cartridges from your printer (you have to install all of the cleaning cartridges for them to be recognized by the printer), and print as normal. 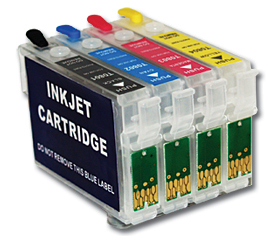 Instead of ink passing through, cleaning solution will be fed through the printer and onto the paper. We recommend you print full pages of colourful pictures so that plenty of the cleaning solution is distributed through the printer. Very Important: There is no guarantee that this product will unblock your print head.